Mmmm cooking with wine is amazing. The flavor is heightened and even a novice cook like myself can turn a meal into a culinary "masterpiece." This time of year is blur and cooking is often the last item on my never-ending to-do list. As the second term comes to end, students frantically finish projects, essays, and gear up for their final exams. There is a perceptible energy shift in the halls. Once chatty social students, bury their heads into their textbooks while highlighting the whole page as important for their final. Quiet students begin to voice their nervous energy as they strategize their study guides with new found study buddies. Teachers who once stopped in the halls to catch up on life's smaller moments, race pass one another on their way to and from the copy machine. At the same time that everything is in a flurry, the halls are also paralyzed by a pending sense of anticipation of the inevitable. The piles of materials to be graded could tip over on my desk and crush me like an avalanche. As we enter this time period, I always wonder: How will I survive this mania? 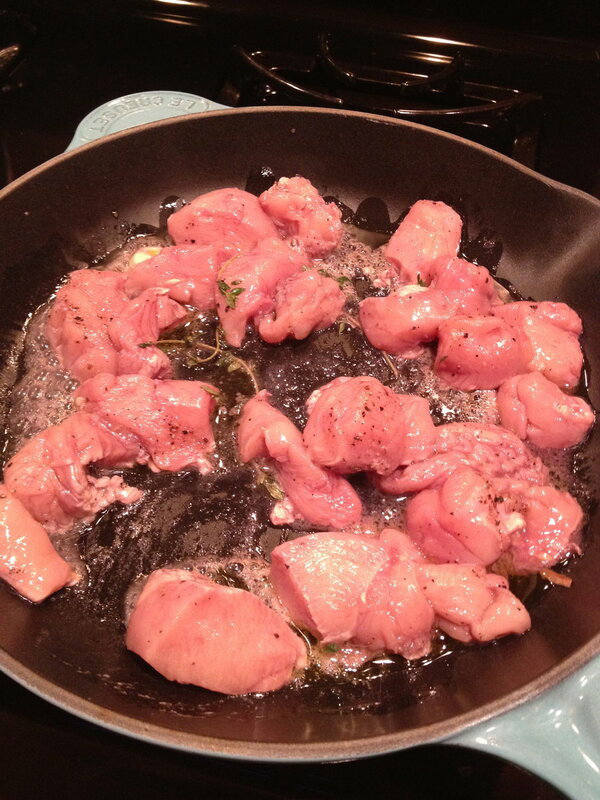 The brief answer on Wednesday night was a nice glass of Côtes du Rhône and a new recipe for coq au vin. It was the best, most decadent decision we could have made the week heading into final exams. 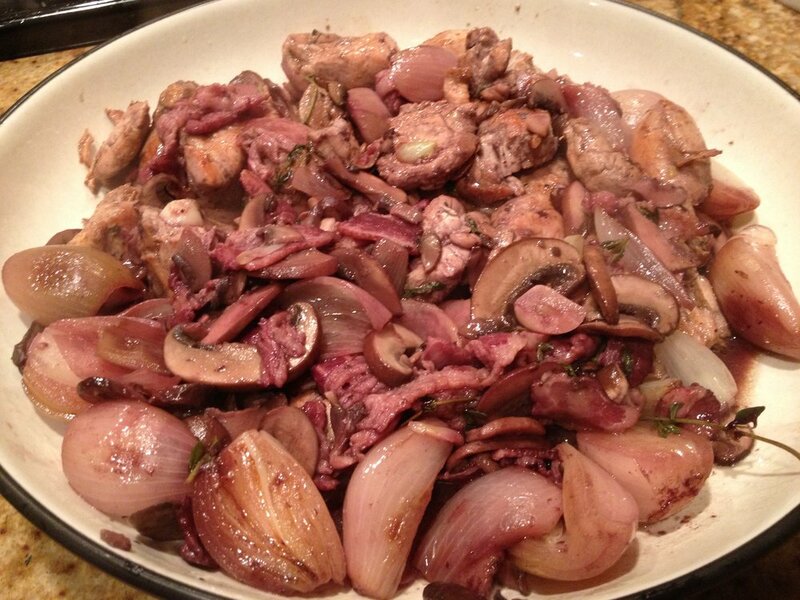 Unlike more traditional recipes this was a quick coq au vin perfect for weeknights. Cut up the chicken into cubes into a bowl. 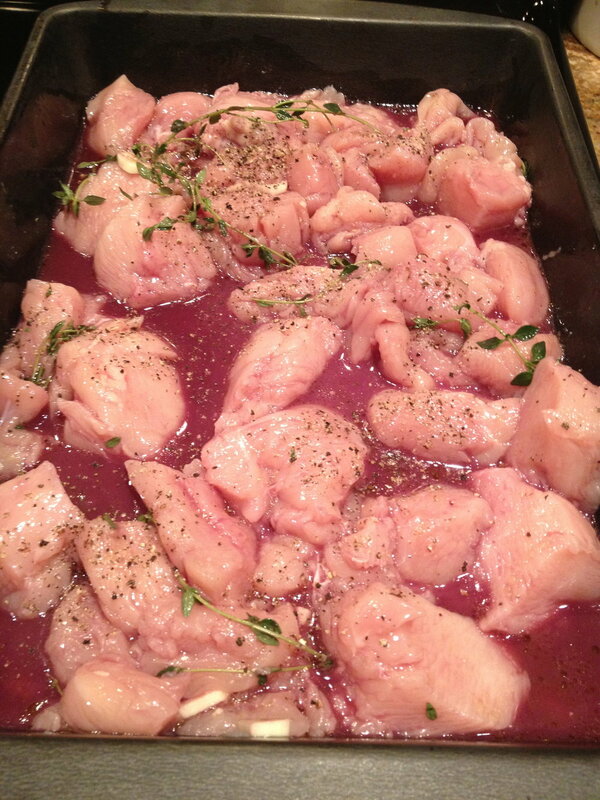 Coat with 2/3 cups of wine, one diced garlic clover, salt, pepper, and thyme. Put in the refrigerator to marinate for 20 minutes. Meanwhile in a large pan, heat 3 table spoons of olive oil. Toss in six or so shallots (cut in half) and cook for about 5-6 minutes or until they begin to brown. 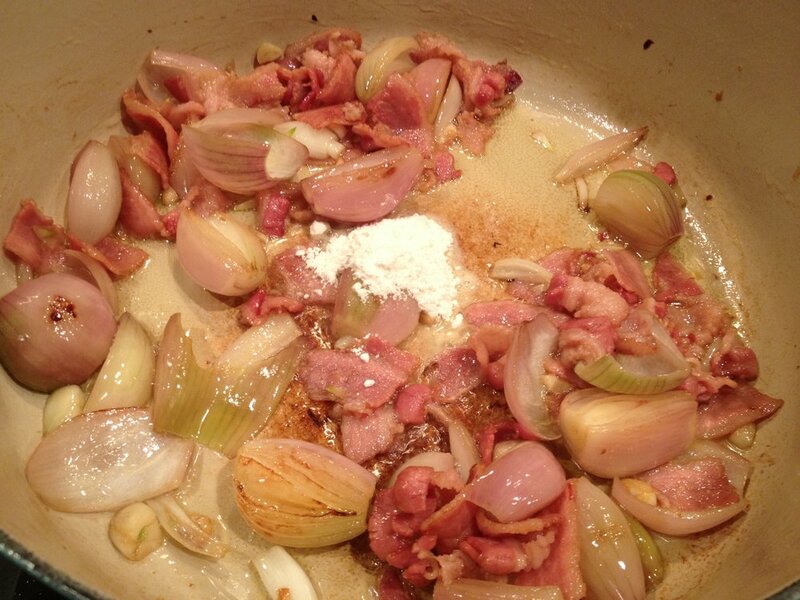 Toss in 8 pieces of bacon cut into strips and cook until they begin to brown about 3-4 minutes. Add two heaping handfuls of sliced portabella mushrooms and a tablespoon of flour and mix together well. Once the mushrooms have reduced in size, add in 1/2 cup of wine, thyme and let simmer for 20 minutes. Take out the chicken and fry up in pan. Once all of the chicken is cooked through toss into the pan with the shallot-mushroom mixture and serve....Voila! !